The enphase microinverters use powerline comunication to talk to an enphase envoy box. Although the envoy looks like an indoor wall mount device (looks similar to my air conditioner's thermostat), the device is actually mounted on the outside wall in a waterproof junction box. Trying to mount the envoy unit indoors would result in very poor communication with the 29 micro inverters. The envoy then relays the production data over ethernet and through my router to enphase's servers on the Internet. Enphase has a simple REST API that I can query to download my production stats to my own database. You can view my hourly production stats since August 2013 in a neat graphical form or the raw table form. On clear sunny days, I can produce over 40 kWh of electricity per day. On cloudy overcast days, I can drop to below 10 kWh per day. Despite my rather large collection of computers and my plug-in electric car (Nissan Leaf), on average, I still end up producing more electricity than I use! My monthly energy bill is not only negative, but largely offsets my other monthly city service fees, such as trash pickup. Okay... Okay... I'm a wuss with the cold. 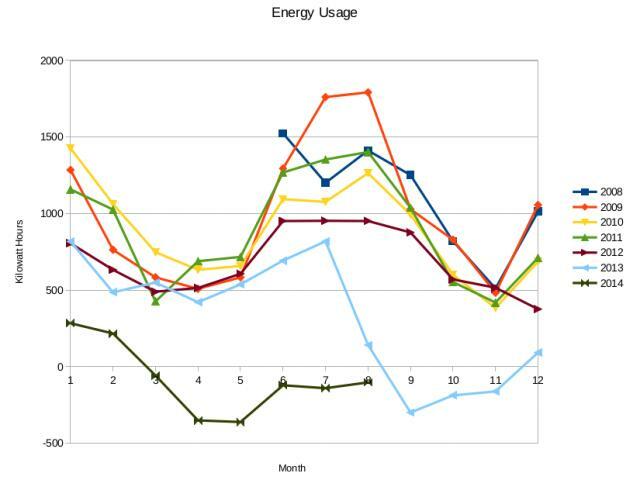 With sub-freezing weather, a multi-week run of overcast skies, driving a plug-in EV car 50 miles a day, and blasting the heater to keep the house comfortably warm this winter caused me to use a bit more electricity than I produced for a few months. But the rest of the year? Well into the negative! Even during the blistering south Texas summer months! In total, during this first year, I produced over 11 MWh of pollution free electricity! How many years will my system take to pay for itself? Well, my monthly utility bill went from an average of about $85 to an average of about $25. So a little over twelve and a half years, using the utility bill alone. But wait! A month or so after I installed my solar panels, I bought a new 2013 Nissan Leaf. Unlike those "hybrids" that cheat and still use an internal combustion engine, this is a "pure" electric vehicle with zero emissions. When I get home, I plug the car into the wall and use some of that free sun-power that I now have an excess of. Bottom line: I haven't stopped at a gas station in a year. All of the monthly gasoline money that I would have spent at the pump should help offset the payback period as well, right? Plus, how much will gas be in 10 years? As gas prices continue to push upwards, my benefit for having "free" electricity for my car will only increase. In summary, solar power is totally worth it. If you own a home, go install some panels on the roof. Your wallet (and the Earth) will thank you. This is an awesome story (great pictures, too!). Solar power seems to be worth it, depending on where you are located, I guess.